A Spyderco for the masses. 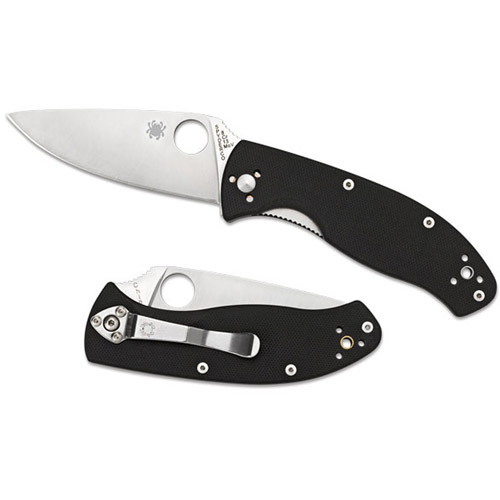 Much less expensive than many Spyderco knives, same out of the box sharp edge. Tip up or down carry and changeable left or right handed. Light, medium length does not scare non knife users.G10 scales grippy, but make knife thin. Nice lanyard hole. Sharper than Benchmade Vex (Tencacious clone) out of the box.I bought for everyday carry, but will get one for each car, and should work for skinning duties and camp tasks.Tight blade lockup, open back for easy cleaning.Available also in all serrated, or partially serrated blade. Maximum value Spyderco for everyone.A quality entry into the world of Spyderco, and fits small or medium hands, so my wife wants one also.